Planning a visit to the Taj Mahal? If you don't know already, there may be a few questions running through your mind like who built the Taj, why was it built, when's the best time to visit, the timings, the fee and a whole lot of stuff that you'd want to know before you pay a visit to the Taj. Don't worry at all, as this section on "Taj Mahal facts" will provide you with a few fast facts to up your knowledge along with the basic queries that you want to be answered as soon as possible. Read on to get some quick information about Taj Mahal and Agra. And once read, don't waste time. Just pack your bags, book your tickets and pay a visit to the world's most spectacular monument that epitomizes love at par. Before his accession to the throne, Shah Jahan was popularly known as Prince Khurram. Shah Jahan fell in love with the beautiful Arjumand Bano Begum and married her, making her his third wife. Arjumand Bano Begum was christened by Shah Jahan as Mumtaz Mahal, meaning the "Chosen One Of The Palace" or "Jewel of the Palace". Shah Jahan lost Mumtaz Mahal, when she died giving birth to their 14h child. For the transportation of the construction materials, more than 1,000 elephants were employed. As many as 28 different varieties of semi-precious and precious stones were used to adorn the Taj with exquisite inlay work. Depending on what time of the day it is and whether or not there's moon at night, Taj Mahal appears to be of different color every time. Some even believe that this changing pattern of colors depict different moods of a woman. Passages from Quran have been used as decorative elements throughout the complex. 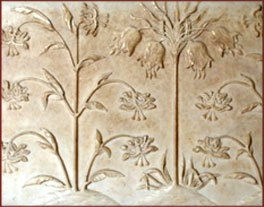 On the sides of the actual tomb of Mumtaz Mahal, 99 names of Allah can be found as calligraphic inscriptions. Taj Mahal was built in stages, with the plinth and the tomb taking up roughly 15 years. Building of minarets, mosque, jawab, and gateway took additional 5 years to be completed. Different types of marbles used in construction of Taj Mahal were brought over from many different regions & countries: Rajasthan, Punjab, China, Tibet, Afghanistan, Srilanka, & Arabia. Many precious stones and Lapis Lazuli (a semi-precious stone) were ripped off from its walls by the Britishers during the Indian rebellion of 1857. Taj Mahal attracts 2-4 million visitors annually with over 200,000 from overseas. Visiting to this site is totally SSL secured and verified by Godaddy® & McAfee™. © 2015, TajTourGuide.com, All rights reserved. TajTourGuide™ is a registered TradeMark Name of our Tour Company.